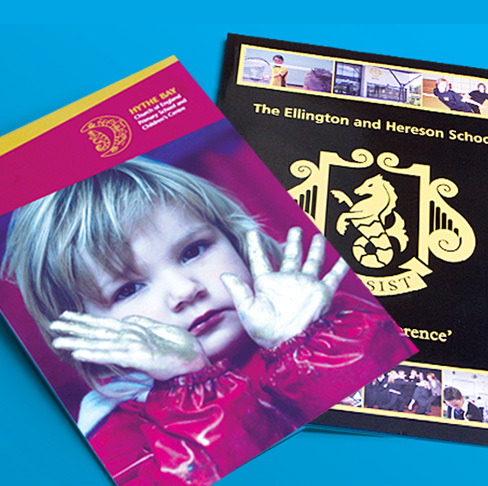 Presentation folders are simply the most effective way of advertising the merits, qualities, achievements and beliefs of your school. A presentation folder can embrace the warmth of your school with the use of photographs, it can shout for the rooftops it’s successful teaching but most of all, it gives the school a professional image, setting you aside from the next local school, helping to maintain student numbers and of course, that all important funding. We have countless cutters available for school folders, which may or may not include extra inside pages. We have an in-house design team who will put together a proof from your ideas supplied and we have a DBS checked photographer dedicated to bring out the best attributes of the school and wonderful, natural photos of the students in their learning environment. We have the facilities for many finishes on your folders which include laminating, foil blocking, spot UV varnishing and multiple pages.In most cases, a personal visit is recommended (but not essential) to pinpoint your preferences, which will be agreed at a mutually convenient time. Please note, you are not under any obligation to continue beyond this point but it does help us gain an understanding of your expectations. Everything is bespoke, so we don’t offer an off-the-shelf price on these products.